Another real grade Gunpla is comming up in April 2018. 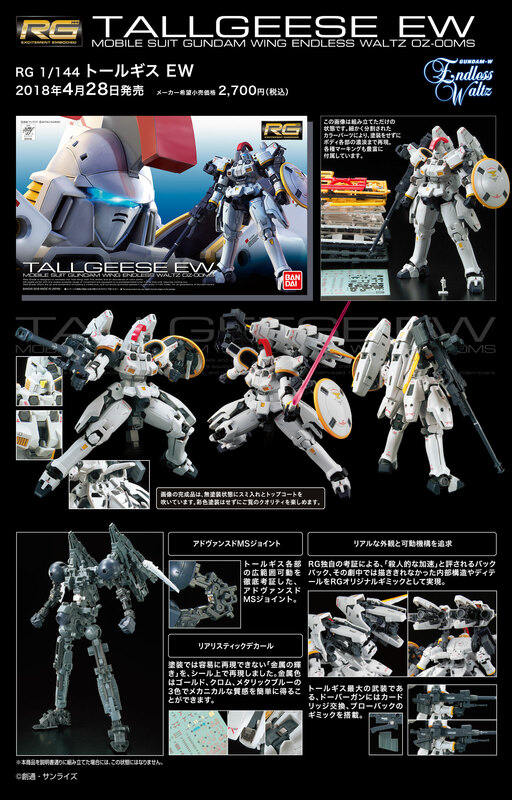 Tallgeese from “Gundam W Endless Waltz” become real grade kit. Distinctive backpack of Tallgeese “super vernier” is highly detailed. The inner mechanism is designed as real grade original, and this makes more real kit even it’s a 1/144 scale. The inner frame of Tallgeese is molded by insertion technology, that makes this Gunpla more complex but easy to build. Main weapon of Tallgeese “dover gun” has a special gimmick of cartridge exchange and blow-back. Also, grip of dover gun can slide, so that Tallgeese can hold in various posing. Lock gimmick is installed in some parts of body, that makes this kit more solid.